UML has a very rich notation for describing FSMs; too rich, in fact, to cover in a single article. 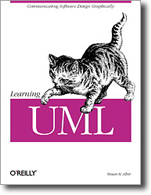 Therefore, this article will focus upon the core FSM notation within UML. This notation is a rather traditional version of the State Transition Diagram (STD) with a few interesting wrinkles. However, thr notation for FSMs in UML also includes elements of flow charts and Petry-nets. It is one of the most complete FSM notations every gathered into a single notation. We’ll be looking at those other facets of FSM notation in subsequent articles.